What is it that you are longing to create in the coming year? And what do you need to let go of in order to allow it to fully take root? Are you willing to entertain the thought that it may come in a form that is unfamiliar to you? Are you clearing the way for success? Every year, we are encouraged to set New Year’s resolutions. We are a goal driven society that is conditioned to seek more. Our egos desire more money, more fame and prestige, and more stuff. A deeper part of ourselves longs for more peace, more meaning, and more purpose in our lives. 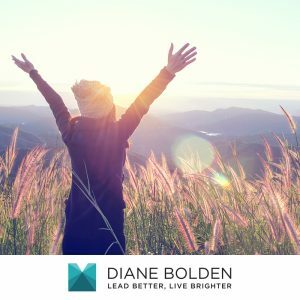 We want to move beyond our previous realizations of what we’ve already accomplished to master newer, better ways of doing things – whether that be what we create in our lives or in our organizations – and as leaders what we are able to inspire others to do as well. Though it is tempting to occupy ourselves with thoughts of how we can go about achieving all of this and what we need to do more of, perhaps what we really need to start with is what we need to do less of – what we need to let go of in order to create the space for something new to come in. We are constantly evolving as human beings – and as communities of human beings. It is so easy to look to the past to define who we are through the things we’ve already done – goals we’ve achieved, titles we’ve acquired, creations we have built. Our previous experiences coagulate to form an identity that is easy to confuse with our true nature. The fact of the matter is, you are not your accomplishments, your creations, or the sum total of the various roles you play in your life – manager, director, vice president, mother, father, friend, son, daughter, etc. You are much, much more than that. Your potential is limitless. And yet, we limit ourselves by these definitions. They filter the experiences we allow ourselves to have and compel us to define the form that our deepest longings should take. In order to be happy, we reason – we must get that promotion, achieve this or that particular goal, hit that target. So we continue to go through the motions, doing the kinds of things we’ve always done – on a sort of auto pilot. Some of this may bring satisfaction, and some may bring a growing source of discontentment. We need to attune ourselves to that which brings us the most of what we truly desire and open ourselves to the possibility that what we really want may need to come in a form that has previously been undefined for us. In short, we must allow ourselves to surrender what we think we know to open up to the mystery that is unfolding in each of our lives. Easier said than done, right? How exactly do you go about letting go of the known when it is all you know? We can take our cues from nature. Snakes and other reptiles shed their skin, trees drop their leaves, and caterpillars create cocoons in which their forms entirely dissolve before recreating themselves in the form of butterflies. Even a fish in a bowl cannot stay in water that contains its excrement – the waste must either be emptied and replaced with new water, or absorbed by something else that will remove it from the fish’s environment. Without engaging in these renewing processes, these creatures will die. And so it is of us. Many of us are already walking around encased in layers of old, dead stuff that needs to be released. What are you holding onto in your life that has run its course? What are the old outmoded ways of doing things that no longer bring you energy? What are the things you’ve acquired that you no longer need? What beliefs are you holding onto that are no longer true for you? Your computer can only handle so much data. If you do not delete old emails and get rid of files that have been accumulating over the years, and if you continue to add new programs without deleting old ones, you will find that it becomes sluggish and unresponsive. Just as freeing up space allows your computer to process things more quickly, so too will clearing your own personal space (whether of things or thoughts) allow you to access new levels of clarity and creativity. You will breathe easier, be more present in every action and interaction you partake of, and bring more of who you really are to what you do. And you will open up the space of possibility that will allow something to come in that may surprise and delight you. Rather than being something you slave away for, it will simply emerge and reveal itself to you. 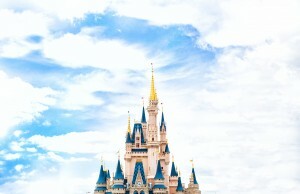 The above article is an excerpt from my book, The Pinocchio Principle: Becoming a Real Leader. The Pinocchio Principle is a roadmap to help you integrate your head with your heart, utilize your intuition, challenge your limits and move out of your comfort zone to unearth your greatest work while inspiring others to do the same. Often when I tell people that I wrote a book called The Pinocchio Principle: Becoming a Real Leader, they assume it must have something to do with ethics. It’s understandable, since the first thing most of us think of when we hear “Pinocchio” is a puppet whose nose grew when he lied. Pinocchio could easily be used as a metaphor for people who lie through their teeth while their proverbial noses grow. I can see why some might think The Pinocchio Principle is a commentary on the importance of honesty in leadership. And while being truthful to oneself and others is a vital part of being a “real” leader, the reason I picked Pinocchio as a metaphor goes much deeper than his nose. Pinocchio is the story of a puppet who longs to become REAL. Like Pinocchio, at our core we too have a burning desire to become real, to bring into creation the greatness that resides somewhere within us. We are born with these impulses — to give form to our distinctive blends of talent, energy, passion and style. We come into the world equipped with far more than we are immediately able to utilize or even comprehend. And though these rich parts of ourselves are always there, they have a way of becoming latent over time. There are people among us who have found ways to tap that well, drawing forth bits of the magic we are all capable of. These are the people we love to watch and be around — who do what they do so well that it is an art. As they tap their inner reserves and unleash their own greatness, they inspire each of us to do the same. In this way, they are true leaders. In Walt Disney’s rendition of Pinocchio, the puppet encounters a blue fairy who tells him, “When you prove yourself to be brave, truthful, and unselfish, Pinocchio, then you will become a real boy.” One could imagine what Pinocchio might have been thinking upon hearing these words. What are these things this fairy speaks of? How do I get them? What must I do? How long will it take? Where do I start? With the promise of a dream fulfilled, he endeavors to do whatever is necessary. And the odyssey begins. The twists and turns it takes are trials we can all relate to, and challenges that I believe are a part of our human experience. The qualities that the Blue Fairy encourages Pinocchio to demonstrate are not things he must acquire. They are attributes he already possesses. But in order to activate them, he must endure a series of events that allow him to realize these qualities are there and to exercise them accordingly. In order to return to himself — his true self — Pinocchio must endure a journey of trials and tribulations that first lure him away from himself. And the same kind of drama seems to unfold in one way or another for each of us. Every one of us has within us an animating genius, which yearns to take different forms depending on who we are. Real leaders could be defined as those whose animating genius longs to create something for the greatest good, which is ultimately accomplished for, with and through others. It has a keen ability to look around, see possibilities and utilize resources in a way that brings something into existence that benefits others, whether that is a family, a community, a non-profit organization, a corporation, or the world at large. To accomplish this, leaders have the distinct charge of working with others in a way that brings out their best — that allows those we can impact to find the animating genius within them and apply it in service of accomplishing a common goal. Many of us associate the primary meaning of “to lead” as directing something on a given course, or being in charge, and this can be one of the functions of leadership. But the essence of leadership is much more than this. 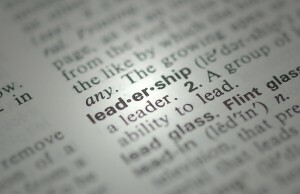 The Merriam Webster Dictionary has the following entry as the first definition listed for the word “lead”: “a: to guide on a way especially by going in advance.” If one of the essential functions of a leader is to bring out the best in others, this definition would suggest that to do this, he or she must first bring out the best in themselves. This, in and of itself, is the very same odyssey our friend Pinocchio finds himself on: to discover and liberate within himself what is real— divinely inspired genius — and to courageously apply it in a way that is truthful and unselfish. 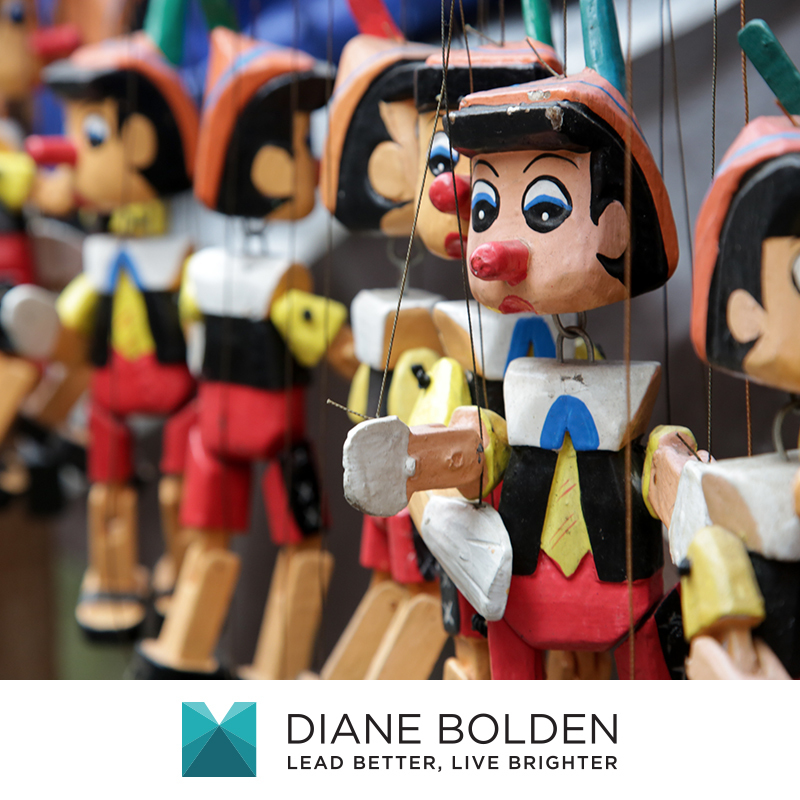 The Pinocchio Principle was written as a roadmap to help people bring to fruition their greatest dreams and visions and better navigate through the perils and possibilities along the way. Reading it will help you better differentiate what is true within yourself from the conditioning that would have you acting in ways that are inauthentic and self-defeating. You will learn methods for gaining clarity on your unique call to leadership and leveraging your experiences to prepare for something bigger. Navigational tools explored within the book will help you determine the extent to which you are on or off course and the direction you need to take next on your journey to becoming a real leader. As you begin to recognize and prevent assumptions and beliefs that keep you from your greatest work, you will learn to utilize ego in service to spirit. With this vital partnership, the elusive promises of Pleasure Island that divert you from your truest fulfillment are easier to recognize and work through. And facing your greatest fears in the belly of the whale becomes a transformational experience that will reunite you with your own determination, courage and heroism. In the end, you will rediscover the power that lies within us all to create and live our dreams. You will also find ways to return to the quiet places within yourself that nurture and inform your greatest visions. 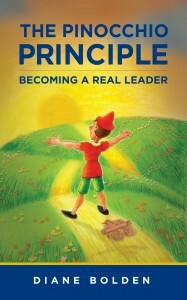 Click here to preview or order your ebook version of The Pinocchio Principle: Becoming a Real Leader for Kindle. Don’t have a Kindle? No worries. Anybody can read Kindle books—even without a Kindle device—with the FREE Kindle app for smartphones and tablets. Click here if you prefer paperback. I’m delighted to announce that my book, The Pinocchio Principle: Becoming a Real Leader is now available as an ebook on the Amazon Kindle store! Today’s post on bringing life back into work is an excerpt from the Preface. I hope you enjoy it. I have always been amazed by the number of people who seem to think of work as something of a necessary evil — simply what must be done in order to earn a paycheck. For so many who toil through their workday, the primary goal is to make it to the weekend so they can really live. Going through the motions, working side by side with others whose hearts and minds they seldom truly connect with, they withhold the very parts of themselves that make them come alive. For some it wasn’t always this way. 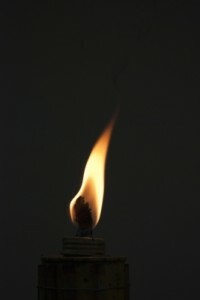 Many began their careers ignited with passion and optimism, only to find that their flames began to flicker as they encountered obstacle after obstacle that kept them from achieving what they believed would be success. Succumbing to the unwritten rules of the organizations and other environments they found themselves in, which suggested they needed to act or think in a certain way to get ahead, they may have slowly sold out on their dreams and relegated themselves to quiet complacency. Many of us were not brought up to expect that work would be fun or gratifying in any way – nor should it be. That’s why they call it work, we may have been told. 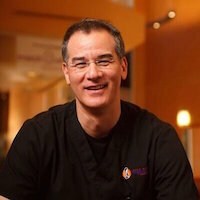 As a result, we may have never really expected much from our careers or professional lives. And as the saying goes, life has a way of living up to our expectations. In just about every corporation, nonprofit or other organization, you will find people in jobs that do not ignite their talents and passions. Some remain dormant in those jobs because they fear that if they pursue their hearts’ desires, they won’t be able to put food on their tables. Many don’t realize that there might be a better alternative. Most of us have learned how to turn ourselves on and off at will, in an effort to spare ourselves the pain of disappointment or frustration — or to maintain what we have come to believe is a professional demeanor. It is not uncommon to hear people say that they are very different at work than they are at home. Those golden parts of ourselves that we think we are protecting suffer when we do not let them breathe and interact in the very realms that provide us opportunities to learn more about who we are and what we are here to do in the world. We miss the chance to become a part of something greater than ourselves. And the organizations and communities we are a part of miss out on the unique contribution each of us has the potential to make. We can no longer afford to fragment ourselves in this way, denying the fulfillment of our secret dreams and downplaying the insights we have about what we can do to make life better — for ourselves, and everyone around us. As more and more of us feel the pain that accompanies the denial of our spirits, we start to realize that the time has come for us to bring the totality of who we are to what we do, no matter our vocation, title or role. We are beginning to awaken to our unique calls to service, creativity and innovation. As we find ways to unleash our distinctive talents and passions at work, we will significantly increase the quality of our own lives, as well as the lives of everyone around us. Corporations that take steps to create environments that allow people to thrive will be met with rich rewards as ingenuity pours forth in ways that lead to increased profit and market share, as well as the creation of self-sustaining cultures that inspire people to sustain success by doing what they do best. There are people among us who have the ability to snap us out of our trances — our states of quiet desperation —and help us bring more of who we truly are to everything that we do. They can do this for others because they have done it for themselves. You may be one of them. The Pinocchio Principle is dedicated to allowing you to play a bigger, more significant and meaningful part in the world by unearthing your own leadership in ways that bring about a greater good — and showing others the way to rise through your own example. Click here to look inside and preview more or to order your ebook version of The Pinocchio Principle: Becoming a Real Leader for Kindle. Don’t have a Kindle? No worries. Anybody can read Kindle books—even without a Kindle device—with the FREE Kindle app for smartphones and tablets. Help me spread the word! Please pass this news on to anyone you think might benefit. 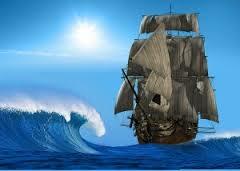 One of the most critical resources in our control when all else seems beyond it is our perspective. The way in which we view things determines the story we tell ourselves about what’s happening, which directly influences the responses we will have. If we believe we are helpless victims at the mercy of something that seeks to destroy us, we will become bitter, resentful and apathetic. In this state our true power remains dormant. We collude with our view of reality to create a condition that validates our doomsday stories and sink even deeper into the abyss. Those who try to rescue us from our self imposed paralysis risk being dragged beneath the current created by our own negativity. Ship photo by 1971yes from Bigstock.com. Hermit crab photo by porbital from FreeDigitalPhotos.net. I almost didn’t post the above video. It’s personal. And it was recorded in a fragile moment. But then I remembered how comforted I have felt by messages from people who were courageous enough to talk about the challenges and frustrations they were working through. And I decided, the hell with it. I’m going to put the video up. If it lifts the hearts of just one or two people, it’ll be worth it. If you’ve ever been in a spot where, despite having access to an overwhelming amount of information and people that seem to have it all figured out, you just can’t seem to find any answers — know that you are not alone. And please also know, that you too will find your way. People have been asking me, What have you done to promote your book? Do you have a publicist? Are you going on tour? I wrote this book — The Pinocchio Principle: Becoming the Leader You Were Born to Be. It took me six years to write it. It’s been out for three months. And I can’t get myself to promote it. I can’t get myself to do anything with it. And I know that I should. So the other day, I was watching a webcast from someone talking about how to become a best seller — how to become a trusted advisor. And I began to fill my head with all these things I thought I should be doing. I found myself taking copious notes. And I got to this point where I couldn’t watch it anymore. I had to turn it off. Something got into me and I literally had to go cry. And I cried so hard I almost threw up. After all that passed, I realized that the reason that I can’t promote my book yet is that I’m looking so hard outside of myself for people to tell me what to do in an arena where I don’t feel like I have the answers. And the irony is that the book I wrote is about how to trust your inner wisdom and how to navigate through your challenges and your uncertainty. And so when I got done crying I had to start laughing. Because it’s kind of funny that I actually already have the workbook I need. It’s right here [in the book I’ve poured my heart into for the last six years]. The truth of the matter is that this book isn’t really as much for you as it is for me. And before I can really promote it — before I can feel as though it will be of value to people, I need to live it. And that’s what I’m going to do.